A shared office space in Toronto can be a great way to establish an office outside of your home. Like any other business decisions, you have to weigh the pros and cons of shared office space. In these economic times, money saved on rent for the best value is a wise idea, especially when starting out. This is great for companies looking to have shared office space on a short term basis, but sharing an office space Toronto may not be for everyone. In considering the pros and cons of shared office space, lets look at the pros. First there is the economics of not having to pay the higher price of a private office space. Then you get to work in an environment with a bunch of different types of people working in various industries, this often provides networking opportunities. Requirements to rent office space are typically less restrictive than with conventional office lease. 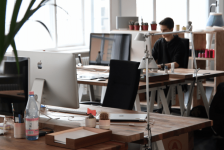 In shared office space, you don’t have to purchase furniture, a phone system, or lease modern office equipment like photocopiers and fax machines. Generally getting started with a new business requires less capital when you use executive suites Toronto instead of an office space for lease. Having a shared office is even a greater solution when you need to keep your risk low and need a more professional image than your home address or P.O. Box on your business cards. In a professional business centre, you don’t have to risk the neighbour’s dog barking in the background while closing that big deal. It is amazing when looking at the pros and cons of shared office space, many people will look for the cons first and not realize how much a professional Toronto office business centre can improve the quality of their work. When talking about the pros and cons of shared office space, some of the cons are truly not cons and are often things that can be worked around or changed. One such presumed con to sharing office space can be a noisy neighbour. There’s nothing more annoying than a long conference call on speaker phone, the solution to that is having them use one of the Toronto meeting rooms or boardrooms that are available. Other perceived cons to Toronto shared office space is that the people sharing the space may not get along or have conflicting schedules that require them to have some time alone in their office. Often this can be fixed by trying to best match tenants based on their schedules, as most people who use Toronto shared offices do not use them all day Monday to Friday. Some shared office clients only use their desks once or twice a week or just in the mornings to check email and send off proposals. If you need total privacy in an office space all the time, than shared offices may not be for you. With Telsec’s shared office space Toronto, they will work with you in finding the pros and cons of shared office space and find an office space solution that works best for you and your company.